This was focused on understanding and protecting your identity in the digital age - the latest on cybersecurity from online standards, updates in Mayo’s security requirements that affect you, hacking awareness, increasing your digital defense and what you need to do in 2018 to minimize chances of becoming a victim of cybercrime. For notes from the talk, click here. 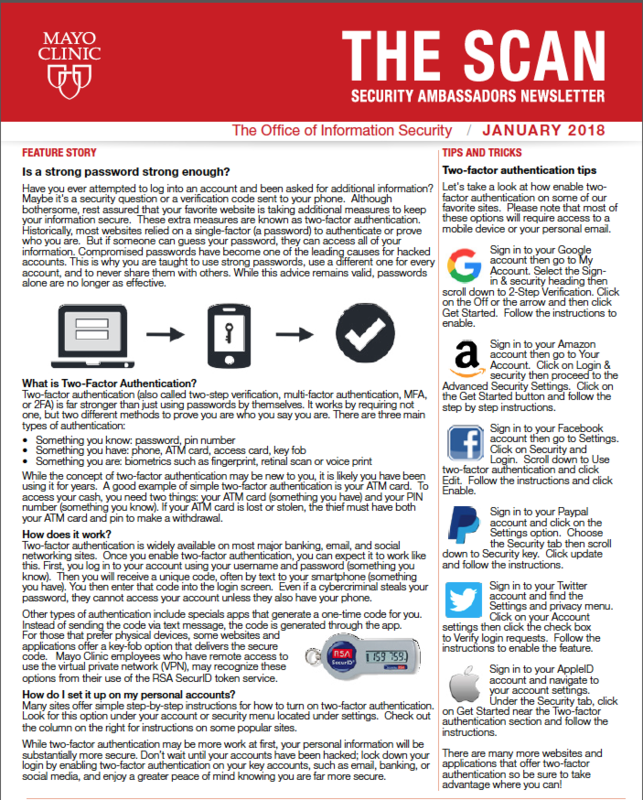 There is also an excellent resource (The Scan) featuring 2-step verification (or authentication). This is stronger than a password alone when logging onto a website or financial institution. Here is how it works: you still log onto a site with your username and password but then you receive a unique code (usually a text) on your smart phone which you then enter to complete the login. To view the article and instructions on how to set this up on a variety of sites, click here.